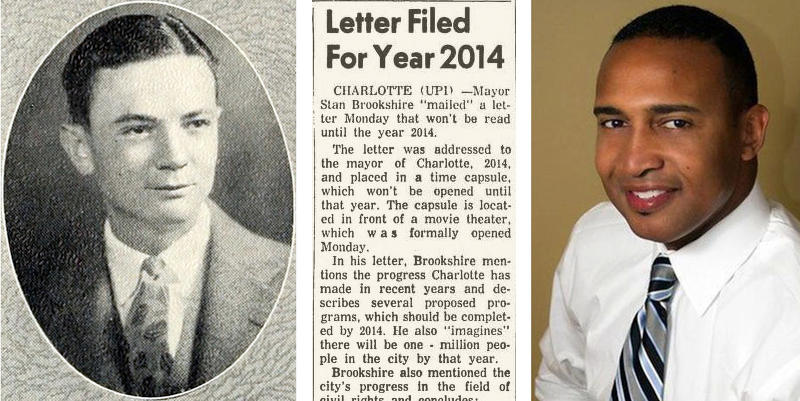 Looks like Mayor Patrick Cannon may get the privilege to open a 50 year old letter from 1964 Mayor Stan Brookshire. Brookshire seemed pretty dead on with his vision of progress in Charlotte and the population of 1 million (758,927 in the city & 1.795 million in the metro). The location of the letter was in a theater that opened up May 11th 1964, but the article did not name the theater. So there is no telling if the time capsule and letter have been lost. UPDATE: WCNC found the location of the the theater and the time capsule. Mayor Stan Brookshire “mailed” a letter Monday that won’t be read until the year 2014. The letter was addressed to the mayor of Charlotte, 2014, and placed in a time capsule, which won’t be opened until that year. The capsule is located in front of a movie theater, which was formally opened Monday. In his letter, Brookshire mentions the progress Charlotte has made in recent years and describes several proposed programs, which should be completed by 2014. He also “imagines” there will be one million people in the city by that year.